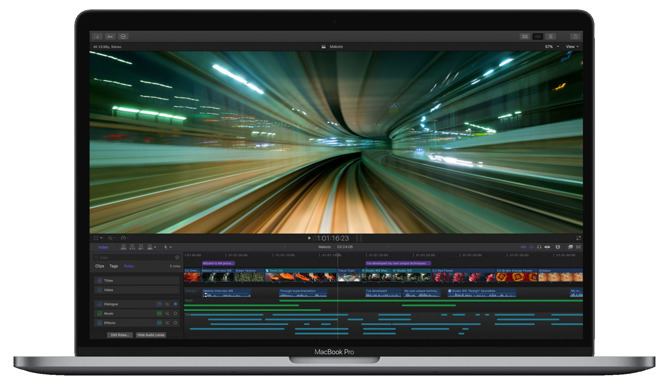 DEAL EXPIRED: Apple authorized reseller B&H Photo is offering shoppers $400 off instantly on Apple's high-end 15-inch MacBook Pro with a faster 2.7GHz processor, 512GB of storage and Radeon 455 graphics. This model in Space Gray (MLH42LL/A) is now $2,399.00 after the cash rebate — and the system even qualifies for free expedited shipping to contiguous U.S. addresses for free delivery in one to three business days. Plus, since B&H will not collect sales tax on orders shipped outside NY and NJ, many shoppers outside those two states can save roughly $525 on average compared to paying full price with tax at the Apple Store, according to our 15-inch MacBook Pro Price Guide. B&H will not collect sales tax on orders shipped outside NY & NJ. Back by popular demand, Apple authorized reseller B&H Photo is slashing the price of 12-inch MacBooks by $500 to $600. The discounts are in the form of instant rebates, delivering the lowest prices anywhere, according to our MacBook Price Guide. Each MacBook also qualifies for free expedited shipping within the contiguous U.S., putting the ultraportable notebook in your hands in one to three business days on average. B&H is also offering no interest when paid in full within 12 months on purchases over $599 with the B&H credit card, allowing for lower monthly payments spread out over a year. For more information, look for the financing options link on the product landing pages linked below. 12-inch MacBook deals 2017 12" MacBook (1.2GHz, 8GB, 256GB) Rose Gold (MNYM2LL/A): $799* ($500 off) - Sold out 2017 12" MacBook (1.3GHz, 8GB, 512GB) Gold (MNYL2LL/A): $999* ($600 off) 2017 12" MacBook (1.3GHz, 8GB, 512GB) Rose Gold (MNYN2LL/A): $999* ($600 off) *B&H will not collect sales tax on orders shipped to several states. Find out more here. Add AppleCare You can easily tack on an AppleCare extended protection plan to these 12-inch MacBooks for $249 by selecting the AppleCare option immediately after you press the "Add to Cart" button on B&H's website. Exclusive discounts have arrived on Apple's latest 27-inch iMac 5K desktop computers, with upgraded 2019 models now $50 to $150 off at Adorama with coupon code APINSIDER. This bonus discount on the brand-new factory sealed systems is in addition to free shipping within the contiguous U.S. for easy delivery to your door. To activate the coupon, you must shop through the special pricing links below or in our 2019 iMac 5K Price Guide and enter promo code APINSIDER at checkout (detailed step-by-step instructions can be found near the bottom of this post). Need help with the coupon? Send us a note at [email protected] and we will do our best to assist. 8GB RAM, Radeon 570X 27" iMac 5K 6-core (3.0GHz 8GB 1TB FUS Radeon 570X): $1,789 ($10 off) 27" iMac 5K 6-core (3.0GHz 8GB 2TB FUS Radeon 570X): $1,949* ($50 off) 27" iMac 5K 6-core (3.0GHz 8GB 256GB Radeon 570X): $1,849* ($50 off) 27" iMac 5K 6-core (3.0GHz 8GB 512GB Radeon 570X): $1,999* ($100 off) 27" iMac 5K 6-core (3.0GHz 8GB 1TB SSD Radeon 570X): $2,399* ($100 off) 16GB RAM, Radeon 570X 27" iMac 5K 6-core (3.0GHz 16GB 1TB FUS Radeon 570X): $1,899* ($100 off) 27" iMac 5K 6-core (3.0GHz 16GB 2TB FUS Radeon 570X): $2,099* ($100 off) 27" iMac 5K 6-core (3.0GHz 16GB 256GB Radeon 570X): $1,999* ($100 off) 27" iMac 5K 6-core (3.0GHz 16GB 512GB Radeon 570X): $2,199* ($100 off) 27" iMac 5K 6-core (3.0GHz 16GB 1TB SSD Radeon 570X): $2,599* ($100 off) 32GB RAM, Radeon 570X 27" iMac 5K 6-core (3.0GHz 32GB 1TB FUS Radeon 570X): $2,299* ($100 off) 27" iMac 5K 6-core (3.0GHz 32GB 2TB FUS Radeon 570X): $2,499* ($100 off) 27" iMac 5K 6-core (3.0GHz 32GB 256GB Radeon 570X): $2,399* ($100 off) 27" iMac 5K 6-core (3.0GHz 32GB 512GB Radeon 570X): $2,599* ($100 off) 27" iMac 5K 6-core (3.0GHz 32GB 1TB SSD Radeon 570X): $2,949* ($150 off) 8GB RAM, Radeon 575X 27" iMac 5K 6-core (3.1GHz 8GB 2TB FUS Radeon 575X): $2,099* ($100 off) 27" iMac 5K 6-core (3.1GHz 8GB 3TB FUS Radeon 575X): $2,199* ($100 off) 27" iMac 5K 6-core (3.1GHz 8GB 256GB SSD Radeon 575X): $1,999* ($100 off) 27" iMac 5K 6-core (3.1GHz 8GB 512GB SSD Radeon 575X): $2,199* ($100 off) 27" iMac 5K 6-core (3.1GHz 8GB 1TB SSD Radeon 575X): $2,599* ($100 off) 16GB RAM, Radeon 575X 27" iMac 5K 6-core (3.1GHz 16GB 1TB FUS Radeon 575X): $2,099* ($100 off) 27" iMac 5K 6-core (3.1GHz 16GB 2TB FUS Radeon 575X): $2,299* ($100 off) 27" iMac 5K 6-core (3.1GHz 16GB 3TB FUS Radeon 575X): $2,399* ($100 off) 27" iMac 5K 6-core (3.1GHz 16GB 256GB Radeon 575X): $2,199* ($100 off) 27" iMac 5K 6-core (3.1GHz 16GB 512GB Radeon 575X): $2,399* ($100 off) 27" iMac 5K 6-core (3.1GHz 16GB 1TB SSD Radeon 575X): $2,799* ($100 off) 32GB RAM, Radeon 575X 27" iMac 5K 6-core (3.1GHz 32GB 1TB FUS Radeon 575X): $2,499* ($100 off) 27" iMac 5K 6-core (3.1GHz 32GB 2TB FUS Radeon 575X): $2,699* ($100 off) 27" iMac 5K 6-core (3.1GHz 32GB 3TB FUS Radeon 575X): $2,799* ($100 off) 27" iMac 5K 6-core (3.1GHz 32GB 256GB Radeon 575X): $2,599* ($100 off) 27" iMac 5K 6-core (3.1GHz 32GB 512GB Radeon 575X): $2,799* ($100 off) 27" iMac 5K 6-core (3.1GHz 32GB 1TB SSD Radeon 575X): $3,149* ($150 off) 64GB RAM, Radeon 575X 27" iMac 5K 6-core (3.1GHz 64GB 1TB FUS Radeon 575X): $2,849* ($150 off) 27" iMac 5K 6-core (3.1GHz 64GB 2TB FUS Radeon 575X): $3,049* ($150 off) 27" iMac 5K 6-core (3.1GHz 64GB 3TB FUS Radeon 575X): $3,149* ($150 off) 27" iMac 5K 6-core (3.1GHz 64GB 256GB Radeon 575X): $2,949* ($150 off) 27" iMac 5K 6-core (3.1GHz 64GB 512GB Radeon 575X): $3,149* ($150 off) 27" iMac 5K 6-core (3.1GHz 64GB 1TB SSD Radeon 575X): $3,549* ($150 off) 8GB RAM, Radeon 580X 27" iMac 5K 6-core (3.7GHz 8GB 3TB FUS Radeon 580X): $2,299* ($100 off) 27" iMac 5K 6-core (3.7GHz 8GB 512GB Radeon 580X): $2,299* ($100 off) 27" iMac 5K 6-core (3.7GHz 8GB 1TB SSD Radeon 580X): $2,699* ($100 off) 27" iMac 5K 6-core (3.7GHz 8GB 2TB SSD Radeon 580X): $3,249* ($150 off) 16GB RAM, Radeon 580X 27" iMac 5K 6-core (3.7GHz 16GB 2TB FUS Radeon 580X): $2,399* ($100 off) 27" iMac 5K 6-core (3.7GHz 16GB 3TB FUS Radeon 580X): $2,499* ($100 off) 27" iMac 5K 6-core (3.7GHz 16GB 512GB Radeon 580X): $2,499* ($100 off) 27" iMac 5K 6-core (3.7GHz 16GB 1TB SSD Radeon 580X): $2,849* ($150 off) 27" iMac 5K 6-core (3.7GHz 16GB 2TB SSD Radeon 580X): $3,449* ($150 off) 32GB RAM, Radeon 580X 27" iMac 5K 6-core (3.7GHz 32GB 2TB FUS Radeon 580X): $2,799* ($100 off) 27" iMac 5K 6-core (3.7GHz 32GB 3TB FUS Radeon 580X): $2,849* ($150 off) 27" iMac 5K 6-core (3.7GHz 32GB 512GB Radeon 580X): $2,849* ($150 off) 27" iMac 5K 6-core (3.7GHz 32GB 1TB SSD Radeon 580X): $3,249* ($150 off) 27" iMac 5K 6-core (3.7GHz 32GB 2TB SSD Radeon 580X): $3,849* ($150 off) 64GB RAM, Radeon 580X 27" iMac 5K 6-core (3.7GHz 64GB 2TB FUS Radeon 580X): $3,149* ($150 off) 27" iMac 5K 6-core (3.7GHz 64GB 3TB FUS Radeon 580X): $3,249* ($150 off) 27" iMac 5K 6-core (3.7GHz 64GB 512GB Radeon 580X): $3,249* ($150 off) 27" iMac 5K 6-core (3.7GHz 64GB 1TB SSD Radeon 580X): $3,649* ($150 off) 27" iMac 5K 6-core (3.7GHz 64GB 2TB SSD Radeon 580X): $4,249* ($150 off) 8GB RAM, Vega 48 27" iMac 5K 6-core (3.7GHz 8GB 2TB FUS Vega 48): $2,649* ($100 off) 27" iMac 5K 6-core (3.7GHz 8GB 3TB FUS Vega 48): $2,749* ($100 off) 27" iMac 5K 6-core (3.7GHz 8GB 512GB SSD Vega 48): $2,749* ($100 off) 27" iMac 5K 6-core (3.7GHz 8GB 1TB SSD Vega 48): $3,099* ($150 off) 27" iMac 5K 6-core (3.7GHz 8GB 2TB SSD Vega 48): $3,699* ($150 off) 16GB RAM, Vega 48 27" iMac 5K 6-core (3.7GHz 16GB 2TB FUS Vega 48): $2,799* ($150 off) 27" iMac 5K 6-core (3.7GHz 16GB 3TB FUS Vega 48): $2,899* ($150 off) 27" iMac 5K 6-core (3.7GHz 16GB 512GB SSD Vega 48): $2,899* ($150 off) 27" iMac 5K 6-core (3.7GHz 16GB 1TB SSD Vega 48): $3,299* ($150 off) 27" iMac 5K 6-core (3.7GHz 16GB 2TB SSD Vega 48): $3,899* ($150 off) 32GB RAM, Vega 48 27" iMac 5K 6-core (3.7GHz 32GB 2TB FUS Vega 48): $3,199* ($150 off) 27" iMac 5K 6-core (3.7GHz 32GB 3TB FUS Vega 48): $3,299* ($150 off) 27" iMac 5K 6-core (3.7GHz 32GB 512GB SSD Vega 48): $3,299* ($150 off) 27" iMac 5K 6-core (3.7GHz 32GB 1TB SSD Vega 48): $3,699* ($150 off) 27" iMac 5K 6-core (3.7GHz 32GB 2TB SSD Vega 48): $4,299* ($150 off) 64GB RAM, Vega 48 27" iMac 5K 6-core (3.7GHz 64GB 2TB FUS Vega 48): $3,599* ($150 off) 27" iMac 5K 6-core (3.7GHz 64GB 3TB FUS Vega 48): $3,699* ($150 off) 27" iMac 5K 6-core (3.7GHz 64GB 512GB SSD Vega 48): $3,699* ($150 off) 27" iMac 5K 6-core (3.7GHz 64GB 1TB SSD Vega 48): $4,099* ($150 off) 27" iMac 5K 6-core (3.7GHz 64GB 2TB SSD Vega 48): $4,699* ($150 off) *Price with coupon code APINSIDER. 1) Make sure you're using a browser with cookies enabled that isn't in private mode. 2) Click on the price link to the desired configuration from this article or the Adorama price links in our Price Guides. You MUST click through our links in the same shopping session that you use our coupon. If you try to save a link for later, the coupon WON'T WORK. Once you click through a price link, you'll see a price that's higher than advertised (we'll fix that in a moment). 3) Add a qualifying 2019 iMac to your cart anyway, and when you're done shopping, begin the checkout process. 4) After you enter your shipping information, move to the Payment section during checkout. 5) Look for a link that says "Do you have a gift card or promo code?" next to the gift icon. Click that to bring up a coupon code field. 6) Enter the coupon code APINSIDER in the field and click apply. The discount should appear under "Promo Savings" above the order total. 7) That's it. As always, if you have any issues, you can reach out to us at [email protected] with the SKU you're interested in and we'll try and help. B&H is delivering the lowest prices anywhere on Apple's Mid 2017 12.9-inch iPad Pros thanks to instant discounts of up to $480 off. Pick up a 64GB model with LTE for just $599, the lowest price ever, or opt for the top-of-the-line 512GB cellular config for just $799 ($480 off). In addition to the cash savings, B&H is also throwing in free expedited shipping within the contiguous U.S. for quick and easy delivery to your doorstep, along with a free screen protector valued at $19.95 with select models. What's more, B&H will not collect sales tax on orders shipped to many states, such as California and Florida. To see how these deals stack up, check out our 12.9-inch iPad Pro Price Guide. iPad Pro deals 64GB 2017 12.9" iPad Pro (Wi-Fi + Cellular) in Silver: $629* ($300 off) - Sold out 64GB 2017 12.9" iPad Pro (Wi-Fi + Cellular) in Gold: $599* ($330 off) - Sold out 256GB 2017 12.9" iPad Pro (Wi-Fi) in Silver: $649* ($300 off) 256GB 2017 12.9" iPad Pro (Wi-Fi) in Gold: $649* ($300 off) 256GB 2017 12.9" iPad Pro (Wi-Fi + Cellular) in Silver: $699* ($380 off) 256GB 2017 12.9" iPad Pro (Wi-Fi + Cellular) in Gold: $699* ($380 off) 512GB 2017 12.9" iPad Pro (Wi-Fi) in Silver: $749* ($400 off) 512GB 2017 12.9" iPad Pro (Wi-Fi) in Space Gray: $749* ($400 off) 512GB 2017 12.9" iPad Pro (Wi-Fi) in Gold: $749* ($400 off) 512GB 2017 12.9" iPad Pro (Wi-Fi + Cellular) in Silver: $799* ($480 off) - Hot deal! 512GB 2017 12.9" iPad Pro (Wi-Fi + Cellular) in Gold: $799* ($480 off) *B&H will not collect sales tax on orders shipped outside these states. Add AppleCare & accessories You can easily tack on an AppleCare extended protection plan to these iPad Pros for $129 by selecting the AppleCare option immediately after you press the "Add to Cart" button on B&H's website. And don't forget must-have accessories, such as the first-gen Apple Pencil and Logitech Slim Keyboard Case. For a limited time, Apple authorized reseller Adorama is taking $150 to $225 off Mid 2018 15-inch MacBook Pros with Vega 16 or Vega 20 graphics. This deal, which can be activated with coupon code APINSIDER using the pricing links below and in our Price Guide, delivers the lowest prices anywhere on the newly released configurations. To activate the code, you must use the pricing links below or in our Price Guide and enter coupon code APINSIDER during checkout using the step-by-step instructions near the bottom of this post. Need help? Send us a note at [email protected] and we will do our best to assist. Please note, this deal could end at any time. 2018 15" MacBook Pros with Vega 16 graphics 15" MacBook Pro (2.6GHz 16GB 512GB Vega 16) Space Gray: $2,824* ($225 off) 15" MacBook Pro (2.6GHz 16GB 512GB Vega 16) Silver: $2,824* ($225 off) 15" MacBook Pro (2.6GHz 16GB 1TB Vega 16) Space Gray: $3,224* ($225 off) 15" MacBook Pro (2.6GHz 16GB 1TB Vega 16) Silver: $3,224* ($225 off) 15" MacBook Pro (2.6GHz 16GB 2TB Vega 16) Space Gray: $4,024* ($225 off) 15" MacBook Pro (2.6GHz 16GB 2TB Vega 16) Silver: $4,024* ($225 off) 15" MacBook Pro (2.6GHz 16GB 4TB Vega 16) Space Gray: $6,024* ($225 off) 15" MacBook Pro (2.6GHz 16GB 4TB Vega 16) Silver: $6,024* ($225 off) 15" MacBook Pro (2.6GHz 32GB 512GB Vega 16) Space Gray: $3,224* ($225 off) 15" MacBook Pro (2.6GHz 32GB 512GB Vega 16) Silver: $3,224* ($225 off) 15" MacBook Pro (2.6GHz 32GB 1TB Vega 16) Space Gray: $3,624* ($225 off) 15" MacBook Pro (2.6GHz 32GB 1TB Vega 16) Silver: $3,624* ($225 off) 15" MacBook Pro (2.6GHz 32GB 2TB Vega 16) Space Gray: $4,424* ($225 off) 15" MacBook Pro (2.6GHz 32GB 2TB Vega 16) Silver: $4,424* ($225 off) 15" MacBook Pro (2.6GHz 32GB 4TB Vega 16) Space Gray: $6,424* ($225 off) 15" MacBook Pro (2.6GHz 32GB 4TB Vega 16) Silver: $6,424* ($225 off) 15" MacBook Pro (2.9GHz 16GB 512GB Vega 16) Space Gray: $3,124* ($225 off) 15" MacBook Pro (2.9GHz 16GB 512GB Vega 16) Silver: $3,124* ($225 off) 15" MacBook Pro (2.9GHz 16GB 1TB Vega 16) Space Gray: $3,524* ($225 off) 15" MacBook Pro (2.9GHz 16GB 1TB Vega 16) Silver: $3,524* ($225 off) 15" MacBook Pro (2.9GHz 16GB 2TB Vega 16) Space Gray: $4,324* ($225 off) 15" MacBook Pro (2.9GHz 16GB 2TB Vega 16) Silver: $4,324* ($225 off) 15" MacBook Pro (2.9GHz 16GB 4TB Vega 16) Space Gray: $6,324* ($225 off) 15" MacBook Pro (2.9GHz 16GB 4TB Vega 16) Silver: $6,324* ($225 off) 15" MacBook Pro (2.9GHz 32GB 512GB Vega 16) Space Gray: $3,524* ($225 off) 15" MacBook Pro (2.9GHz 32GB 512GB Vega 16) Silver: $3,524* ($225 off) 15" MacBook Pro (2.9GHz 32GB 1TB Vega 16) Space Gray: $3,924* ($225 off) 15" MacBook Pro (2.9GHz 32GB 1TB Vega 16) Silver: $3,924* ($225 off) 15" MacBook Pro (2.9GHz 32GB 2TB Vega 16) Space Gray: $4,724* ($225 off) 15" MacBook Pro (2.9GHz 32GB 2TB Vega 16) Silver: $4,724* ($225 off) 15" MacBook Pro (2.9GHz 32GB 4TB Vega 16) Space Gray: $6,724* ($225 off) 15" MacBook Pro (2.9GHz 32GB 4TB Vega 16) Silver: $6,724* ($225 off) *Price with coupon code APINSIDER. 2018 15" MacBook Pros with Vega 20 graphics 15" MacBook Pro (2.6GHz 16GB 512GB Vega 20) Space Gray: $2,999* ($150 off) 15" MacBook Pro (2.6GHz 16GB 512GB Vega 20) Silver: $2,924* ($225 off) 15" MacBook Pro (2.6GHz 16GB 1TB Vega 20) Space Gray: $3,324* ($225 off) 15" MacBook Pro (2.6GHz 16GB 1TB Vega 20) Silver: $3,324* ($225 off) 15" MacBook Pro (2.6GHz 16GB 2TB Vega 20) Space Gray: $4,124* ($225 off) 15" MacBook Pro (2.6GHz 16GB 2TB Vega 20) Silver: $4,124* ($225 off) 15" MacBook Pro (2.6GHz 16GB 4TB Vega 20) Space Gray: $6,124* ($225 off) 15" MacBook Pro (2.6GHz 16GB 4TB Vega 20) Silver: $6,124* ($225 off) 15" MacBook Pro (2.6GHz 32GB 512GB Vega 20) Space Gray: $3,324* ($225 off) 15" MacBook Pro (2.6GHz 32GB 512GB Vega 20) Silver: $3,324* ($225 off) 15" MacBook Pro (2.6GHz 32GB 1TB Vega 20) Space Gray: $3,724* ($225 off) 15" MacBook Pro (2.6GHz 32GB 1TB Vega 20) Silver: $3,724* ($225 off) 15" MacBook Pro (2.6GHz 32GB 2TB Vega 20) Space Gray: $4,524* ($225 off) 15" MacBook Pro (2.6GHz 32GB 2TB Vega 20) Silver: $4,524* ($225 off) 15" MacBook Pro (2.6GHz 32GB 4TB Vega 20) Space Gray: $6,524* ($225 off) 15" MacBook Pro (2.6GHz 32GB 4TB Vega 20) Silver: $6,524* ($225 off) 15" MacBook Pro (2.9GHz 16GB 512GB Vega 20) Space Gray: $3,224* ($225 off) 15" MacBook Pro (2.9GHz 16GB 512GB Vega 20) Silver: $3,224* ($225 off) 15" MacBook Pro (2.9GHz 16GB 1TB Vega 20) Space Gray: $3,624* ($225 off) 15" MacBook Pro (2.9GHz 16GB 1TB Vega 20) Silver: $3,624* ($225 off) 15" MacBook Pro (2.9GHz 16GB 2TB Vega 20) Space Gray: $4,424* ($225 off) 15" MacBook Pro (2.9GHz 16GB 2TB Vega 20) Silver: $4,424* ($225 off) 15" MacBook Pro (2.9GHz 16GB 4TB Vega 20) Space Gray: $6,424* ($225 off) 15" MacBook Pro (2.9GHz 16GB 4TB Vega 20) Silver: $6,424* ($225 off) 15" MacBook Pro (2.9GHz 32GB 512GB Vega 20) Space Gray: $3,624* ($225 off) 15" MacBook Pro (2.9GHz 32GB 512GB Vega 20) Silver: $3,624* ($225 off) 15" MacBook Pro (2.9GHz 32GB 1TB Vega 20) Space Gray: $4,024* ($225 off) 15" MacBook Pro (2.9GHz 32GB 1TB Vega 20) Silver: $4,024* ($225 off) 15" MacBook Pro (2.9GHz 32GB 2TB Vega 20) Space Gray: $4,824* ($225 off) 15" MacBook Pro (2.9GHz 32GB 2TB Vega 20) Silver: $4,824* ($225 off) 15" MacBook Pro (2.9GHz 32GB 2TB Vega 20) Space Gray: $6,824* ($225 off) 15" MacBook Pro (2.9GHz 32GB 2TB Vega 20) Silver: $6,824* ($225 off) *Price with coupon code APINSIDER. 1) Make sure you're using a browser with cookies enabled that isn't in private mode. 2) Click on the price link to the desired configuration from this article or the Adorama price links in our Price Guides. You MUST click through our links in the same shopping session that you use our coupon. If you try to save a link for late, the coupon WON'T WORK. Once you click through a price link, you'll see a price that's higher than advertised (we'll fix that in a moment). 3) Add the MacBook to your cart anyway, and when you're done shopping, begin the checkout process. 4) After you enter your shipping information, move to the Payment section during checkout. 5) Look for a link that says "Do you have a gift card or promo code?" next to the gift icon. Click that to bring up a coupon code field. 6) Enter the coupon code APINSIDER in the field and click apply. The discount should appear under "Promo Savings" above the order total. 7) That's it. As always, if you have any issues, you can reach out to us at [email protected] and we'll try and help. 1) Make sure you're using a browser with cookies enabled that isn't in private mode. 2) Click on the price link to the desired configuration from this article or the Adorama price links in our Price Guides. 3) On the product page, look for the "Ways to Save" section underneath the price and "More Product" Options. 4) Look for a link that says "view details" next to "6 or 12 Month financing available**". Click that to bring up a popup to apply. 5) Click the blue Apply Now button. 6) Proceed with the application process, reviewing the terms and conditions along the way. February savings are in effect now at B&H with the lowest prices anywhere on Apple Watch Series 3 devices. Save up to $400 on GPS Only and GPS + Cellular models with free expedited shipping within the contiguous U.S. These deals in many instances match Black Friday prices. B&H also will not collect sales tax on orders shipped outside these states, which for many shoppers can tack on an additional $20 to $38 in savings on top of the instant cash rebates. For a full list of Apple Watch deals, check out our Apple Watch Price Guide. Apple Watch Series 3 (Stainless Steel) deals + free gift 38mm GPS + Cellular (Space Black Stainless, Space Black Milanese Loop): $399.99* ($350 off) 38mm GPS + Cellular (Space Black Stainless, Black Sport Band): $469.99* ($130 off) - Sold out 42mm GPS + Cellular (Space Black Stainless Steel, Black Sport Band): $349* ($300 off) 42mm GPS + Cellular (Stainless Steel, Soft White Sport Band): $349* ($300 off) 42mm GPS + Cellular (Space Black Stainless Steel, Space Black Milanese Loop): $379* ($420 off) 42mm GPS + Cellular (Stainless Steel, Steel Milanese Loop): $439* ($310 off) Apple Watch Series 3 (Aluminum) deals + free gift 38mm GPS + Cellular (Space Gray, Gray Sport Loop): $279* ($100 off) 38mm GPS + Cellular (Space Gray, Gray Sport Band): $274* ($105 off) 38mm GPS + Cellular (Silver Aluminum, Fog Sport): $299* ($80 off) - Sold out 38mm GPS + Cellular (Silver Aluminum, Seashell Sport Loop): $299* ($80 off) 38mm GPS + Cellular (Gold Aluminum, Pink Sand Sport): $319* ($60 off) - Sold out 38mm GPS + Cellular (Space Gray, Dark Olive Sport Loop): $299* ($80 off) 42mm GPS + Cellular (Silver, Seashell Sport Loop): $279* ($130 off) 42mm GPS + Cellular (Space Gray, Dark Olive Sport Loop): $299* ($115 off) 42mm GPS + Cellular (Space Gray, Gray Sport Band): $329* ($70 off) 42mm GPS + Cellular (Silver Aluminum, Fog Sport): $329.99* ($80 off) 42mm GPS + Cellular (Space Gray, Gray Sport Loop): $329* ($80 off) 42mm GPS + Cellular (Gold Aluminum, Pink Sand Sport Loop): $329* ($80 off) Apple Watch Nike+ Series 3 deals 38mm Nike+ GPS + Cellular (Space Gray, Black/Platinum Nike Sport Loop): $269* ($110 off) - Sold out 38mm Nike+ GPS + Cellular (Silver, Platinum/Black Nike Sport): $279* ($100 off) - Sold out 38mm Nike+ GPS + Cellular (Space Gray, Midnight Fog Nike Sport Loop): $269* ($110 off) - Sold out 38mm Nike+ GPS + Cellular (Space Gray, Anthracite/Black Nike Sport): $279* ($100 off) - Sold out 42mm Nike+ GPS + Cellular (Silver, Crimson/Black Nike Sport Loop): $279 ($130 off) 42mm Nike+ GPS + Cellular (Space Gray, Black/Platinum Nike Sport Loop): $289 ($120 off) 42mm Nike+ GPS + Cellular (Space Gray, Anthracite/Black Nike Sport): $299 ($110 off) - Sold out *Eligible for free band or screen protector. B&H will not collect sales tax on orders shipped outside these states. While supplies last, MacSales.com has Apple HomePods on sale for $249.88, a discount of $50 off MSRP. These HomePods are in non-retail packaging and come with an OWC 1-year limited warranty, allowing for the triple digit savings off normal retail. Prefer a HomePod in new retail packaging? Save $20 on the smart speakers in the AppleInsider Shop. Picaso Lab this week is knocking 10 percent off any order with promo code AppleInsider10 exclusively for AI readers. Featuring handcrafted cases and sleeves for your favorite Apple products, including the latest MacBook Pros and 2018 iPad Pros, these products scored extremely well during our hands-on reviews. Each product features a lifetime warranty — and even Steve Wozniak, Apple's co-founder, uses Picaso Lab accessories for his personal devices. SOLD OUT: Back by popular demand, AppleInsider readers can save $30 on Funcl AI earbuds, bringing the cost down to $48.98 with coupon code AIEXCLUSIVE. This deal, which is available only at AppleInsider, delivers the lowest price available on the Bluetooth earphones, making them a great budget-friendly alternative to Apple AirPods. Both color options are eligible for the coupon discount, which is valid for a limited time only. Funcl AI Bluetooth earbuds: $48.98 ($30 off) *Price with coupon code AIEXCLUSIVE. To see how well the Funcl AI earbuds performed, check out our hands-on review. Adorama sales rep Lewis will be handling your call.